What is the AREAS Function? The AREAS Function in Excel is a Lookup/Reference functionFunctionsList of the most important Excel functions for financial analysts. This cheat sheet covers 100s of functions that are critical to know as an Excel analyst. 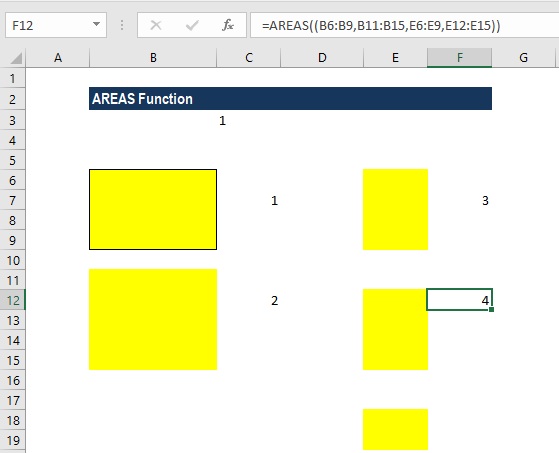 The function will take an Excel reference and returns the number of areas that make up the reference. It is available starting from MS Excel 2007. Reference (required argument) – It can be a standard Excel reference or a list of references or a named range. 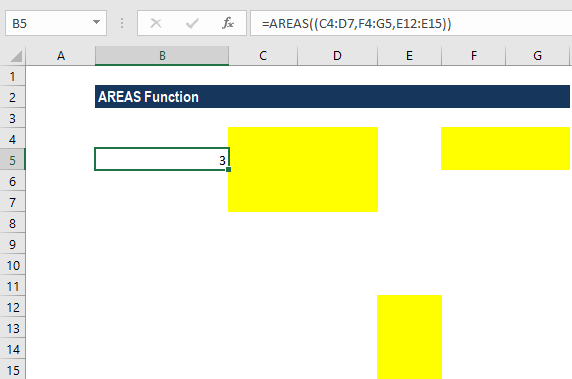 How to use the AREAS Function in Excel? 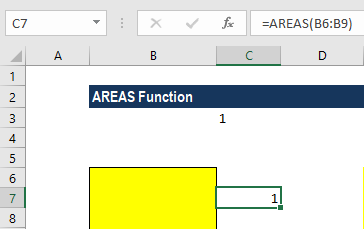 AREAS is a simple function of Excel. So, when we give the formula AREAS(B1), we will get the result as 1. Now let’s see how the function behaves when we provide ranges as a reference. As you can see in the screenshot below, we provided the formula for the highlighted range (yellow). The formula used is =AREAS(B6:B9). This function will return 1 as the range selected is only one. In our next example, I selected two ranges. The formula used, AREAS((B6:B9,B11:B15)), will give a result of 2. For selecting more than one range, we open a bracket and provide ranges separated by columns and close the brackets. On a similar basis, we will get a result of 3 when 3 ranges are selected, 4 when we select 4 ranges, and so forth. Remember to separate each range with a comma, or else, it will give a #NAME? error. 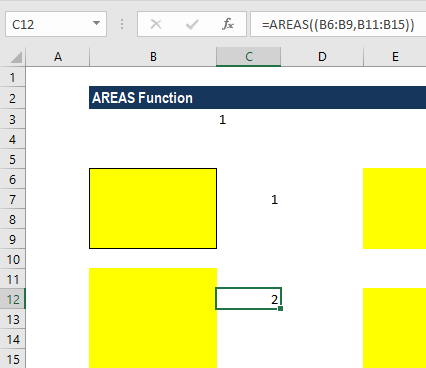 AREAS is one of the less useful information functions in Excel. The function’s only use is to return the number of areas in a given range reference. Practically, there is little or no need for it at all as it’s not required in those Excel functions that can handle general references such as SUM. Furthermore, it’s unnecessary to deal with functions that can handle only single area ranges (like SUMIF) since we can use INDEX(Range,0,0,1) to refer to the first area of a general range reference. Suppose we’ve supplied the reference to a named range (called ‘E_Range’), which is made up of the 3 areas shown in the ‘Formula’ spreadsheet below. In this scenario, the AREAS function returns the result 3. We can either type the entire formula or after typing “=AREAS(“ into a cell, we can use the CTRL + A without leaving the cell to open the “Insert Function Dialog Box” for detailed commands. A #NULL! error will be returned when the reference given is in an incorrect format. For example, AREAS(A2 B4) instead of AREAS(A2:A4).